Are Directories Hiding Deaths For You? City directories can tell researchers several things, usually related to name, residence, occupation and proximity of neighbors. Urban researchers are usually well-served by researching all extant directories for their people of interest. In some unusual circumstances directories can tell researchers even more. Noticing these items requires the researcher to search for the people of interest in every single directory in which they may be listed–and even in ones after their death. 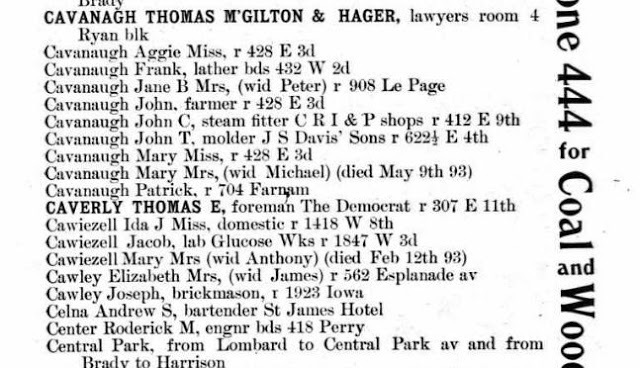 Sometimes the temptation is to find the ancestor in a few directories and stop because “the others won’t tell me anything I don’t already know.” That sometimes is a mistake. This image comes from a late 19th century city directory for the city of Davenport, Iowa. Stone’s 1894-1895 Davenport [Iowa] City Directory, p. 105, Davenport, Iowa,H. N. Stone Publishers; digital image, . Ancestry.com, 30 December 2012. Based upon this one line, I know that Mrs. Mary Cawiezell had been married to Anthony Cawiezell prior to his death and that Mrs. Cawiezell died on 12 February 1893. The information in this entry may not be completely accurate. Names for non-English speakers, which the Cawiezells were, can be incorrect. It is possible that the date of death may be slightly off, but the year and probably the month are correct. To confirm Mary’s residence and determine approximately when Anthony Cawiezell died, my searches will have to continue with 1893 and work backwards. Mrs. Cawiezell is likely listed in the directory published in 1893 as it most likely contained information obtained in 1892. Deaths can be listed in unexpected places. City directories are just one of those places.